As I looked back over the Posts I’ve made since January, it became evident that I approached this whole subject of the 21st Century Library from the perspective that it was a given. From the continued lack of useful information, subject related publications and conversation after seven months, that is so obviously not the situation. It therefore seemed appropriate to begin a series of Posts directly focused on the 21st Century Skills efforts within education, and how it relates to the 21st Century Library, and 21st Century Librarianship. Why the big focus on 21st Century Skills in education? because, as I mentioned in my second Post on January 26 (21st Century Librarians create 21st Century Libraries), education is taking the lead in preparing the next generation for working and living in the 21st Century. LIBRARIES ARE NOT! 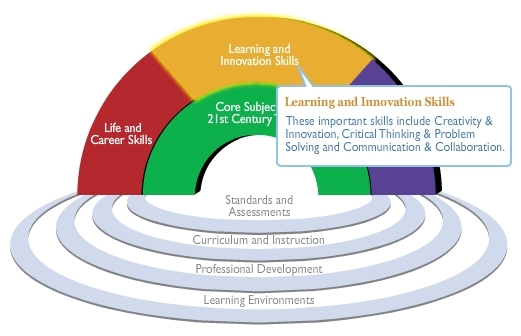 So, for those not familiar with the 21st Century Skills initiatives in US education, this Post should provide some thought provoking information about the only coherent plan to enable schools to help students learn these skills recognized as essential for 21st Century success, not only of the individual, but for our economy – our society. The Partnership for 21st Century Skills (P21) is a unique public-private organization formed in 2002 to create a successful model of learning for this millennium that incorporates 21st century skills into our education system. The U.S. Department of Education is a key partner with P21, and its members include Apple Computers, Cisco Systems, Microsoft, and National Education Association. 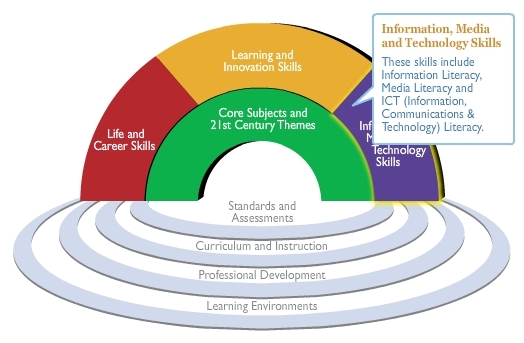 From P21’s publication The Intellectual and Policy Foundations of the 21st Century Skills Framework is the following. In my Post on May 27 (Changes in Our Librarian Education for the 21st Century) I highlighted both the disconnect between teachers and students in our primary education system, as well as a YouTube video (Partnership for 21st Century Skills: Teaching 21st Century Learners) about teacher education changes that are coming. A review of these sources should give librarians some insight into the new generation of library services consumer who will have little or no need of our skills – UNLESS WE DEVELOP 21ST CENTURY LIBRARIAN SKILLS! Bottom line is that education revolution is coming. Only a few of you may be seeing changes and initiatives at your local level already, but change is coming. EVERYONE recognizes that education reform is necessary to move from the industrial model of education to the information age model. IT MUST CHANGE! If there is a single librarian reading this that does not believe this change WILL impact our roles as librarians (first in the schools and universities and then in the public library sector), please explain your reasoning to me, because I don’t see how it can NOT profoundly and irreversibly change our role as librarians. Please share your experiences with education reform or 21st Century Skills.